Synopsis: Doctor Lynn Davis is kidnapped by handsome Lord Kyle von Talion and taken to a far off planet, Saldiora. As she finds herself in this unfamiliar culture, she must learn to fight with a sword, ride a talking horse, and endure the politics of a royal court if she is to survive. Kyle has his hands full keeping Lynn from making cultural blunders and ensuring her safety. The Juntu’s are plotting to take over Saldiora and consider Lynn to be a threat to their success. Will Lynn live long enough to fulfill her destiny and save the kingdom of Saldiora? Linda Harley was born in Durban, South Africa and at the age of 7 developed a love for music. Her love for playing the piano has been a great motivational factor in pursuing her research in trying to understand how humans are able to learn to perform complex tasks with both arms at the same time. She received a BS and MS in Civil Engineering from the Georgia Institute of Technology, USA in 2002 and 2004, respectively and in 2011 she received her PhD in Applied Physiology from the Georgia Institute of Technology. Her research interests are in understanding the mechanisms of learning to perform complex bilateral tasks and designing new technologies which would be beneficial to the field of physical rehabilitation. For example, the design of electronic games for the purpose of rehabilitation at home. Linda has several hobbies, including writing novels, playing the piano on Sundays at Ingleside Presbyterian Church, knitting, and being involved in online communities such as Facebook and Lord of the Rings Online (LOTRO). Her involvement in LOTRO has given her many insights into the social intricacies of navigating online communities and have influenced her research on Gaming for Rehabilitation. For more information, you can read about her involvement in LOTRO here. 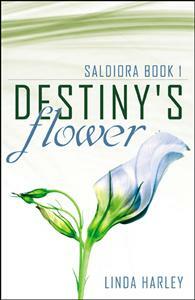 Giveaway: Ebook copies of Destiny's Flower. The number of winners depends on how many enter the giveaway, up to 10 winners. Open internationally.